Monday 23rd November saw the launch of the official Pixies iPhone application. Something the world might have been waiting for, or maybe not. Seriously though, it looks like pretty good fun for a free app. The Pixies are no strangers to Apple, having released an iTunes exclusive track Bam Thwok back in 2004. They also recently showed that they can embrace new technology with USB wristbands containing live material and videos being made available after shows on their recent Doolittle 20th Anniversary Tour. 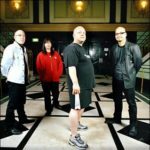 The Pixies free app includes all the basics one would expect, tour dates, links to buy Pixies music & merchandise, official and fan photos (you can upload your own direct from the app), plus various other links to live concert videos and the band’s official website. One feature of the app is a Tweet-like stream of stories, or Blog, with links to Pixies related items, videos and photos. One of the links I tried was showing a video (via YouTube) looking at the putting together of the recent Minotaur boxset. Quite nice to see it’s lush packaging, especially as most fans will never be able to afford it. So if you’re a Pixies fan, and addicted to free apps, head on over to the iTunes store and get downloading it. Strange story, but completely true…whilst traveling to see the Pixies at Brixton Academy on their recent tour, I put my iPod on shuffle and the first two tracks it played were both from Doolittle! And just to add to the weirdness, it played a further song from the album three tracks later. Weird. Check out an excellent performance from the Pixies on the David Letterman show below. This entry was posted on Tuesday, November 24th, 2009 at 2:13 am	and is filed under Music, News. You can follow any responses to this entry through the RSS 2.0 feed. You can leave a response, or trackback from your own site.